At Bauer, we take pride in offering high quality motors, upgrades, repairs and maintenance. With extensive technical experience and a comprehensive line of products, we can help any enterprise increase productivity and ensure they have the gear needed for the job. When it comes to custom installations with specific constraints, we can provide specialized equipment like right angle gear motors. Right angle gear motors are ideal for operations where space may be constrained or different gear types are needed. They have a driveshaft and output shaft at 90 degrees from each other from the speed reducer. Depending on the requirements for the transmission, shafts can divide a single plane or two parallel planes, producing an axial motion. Right angle gear motors are used most often in applications where there are space constraints. They can produce enough speed, torque, and power efficiency for just about any application. There are several types of right angle gear motors like the offset gear motor. It uses several gear wheels by moving the power of the central shaft to the parallel access. 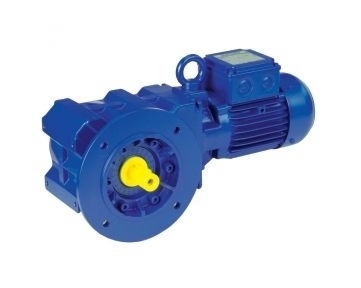 These offset gear motors are often found in food and beverage equipment and pump dispensers. One can also employ a hypoid gear motor, which is similar to spiral bevel gear motors but do not intersect with the shaft. It allows installation of end bearings for more support for heavy applications. Worm Gears - for single stage speed reduction operations. Offset Gears - commonly used in food equipment and pumps dispensers. These gears feature several gears that power the central shaft of the motor to a parallel axis. Helical Gears - helical gears feature tooth cut gears at an angle to produce less stress to the motor. Spur Gears - teeth that are cut parallel to the shaft reduce speeds when more gears are used. Spiral Bevel Gears – ideal for quieter operations with teeth that are spiral in shape. Contact or visit us today to learn more about right angle gear motors with the experts at Bauer GMC.